Join media, librarians, booksellers, educators, reviewers and bloggers who use NetGalley to discover, read and share reviews about new books before they are published. It's easy to get started: just sign in or join for free. Remember to select the "New York City School Library System" when you join! Access current and back catalogs from publishers, as well as electronic advance review copies. 1. Graphics are engaging forms of text. 2. Provide exciting reading experiences for all kinds of readers. --For weak readers, concise text paired with detailed images to help readers decode and comprehend the text. 3. Graphic novels draw the reader into the story. 4. Lots of diversity in themes, formats, illustration style, graphic arts, and subject matter are available in graphic novels! -From How Comics and Graphic Novels can help your kids love to read! 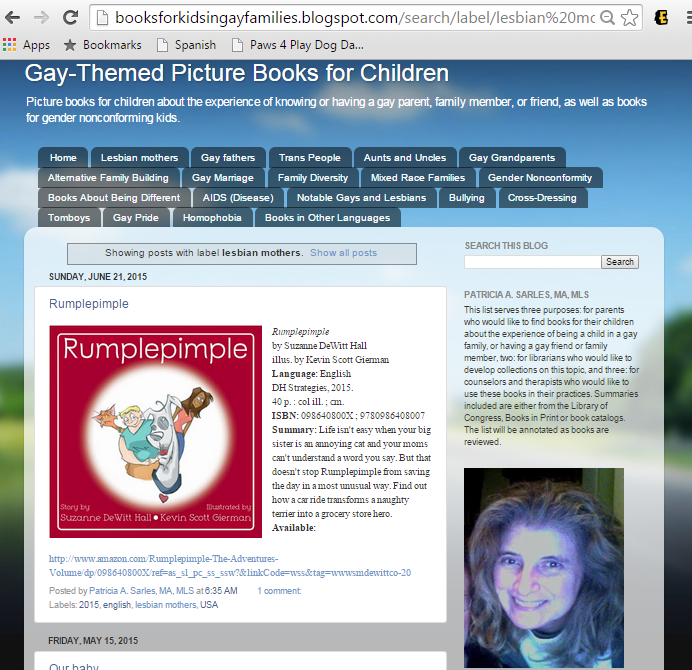 This list serves three purposes: for parents who would like to find books for their children about the experience of being a child in a gay family, or having a gay friend or family member, two: for librarians who would like to develop collections on this topic, and three: for counselors and therapists who would like to use these books in their practices. Summaries included are either from the Library of Congress, Books in Print or book catalogs. The list will be annotated as books are reviewed.